Every once in a while, when reading the Word, an expression or an individual word stands out, and it happened again the other day. It’s a word that I have always understood to mean one thing and yet, behind that meaning is a key element that takes the word to a new level. Let’s look at it as used in a carol that everyone no doubt sang a few weeks ago. 2 Tim 4:2 Preach the word! Be ready in season and out of season. Convince, rebuke, exhort, with all longsuffering and teaching. The word “preach” is kerusso, which means “to proclaim as a herald.” But what’s important here is that it means to proclaim “without” any reference to the matter being proclaimed. It is the picture of a “herald” standing in the emperor’s name in some public place and conveying a proclamation. Or put another way, a statement from the emperor that leaves no room for discussion or debate. It is being proclaimed and calls for immediate obedience. Paul stood as God’s herald, handing down His divine ultimatum to the world He created… and the result? Paul made a statement of fact and left no room for argument. The proclamation had been given to him to deliver and he delivered it and left without discussion. And so had Timothy been given a proclamation to “herald” in Ephesus; to stand and deliver (to preach) the gospel message, both the warning and good news. 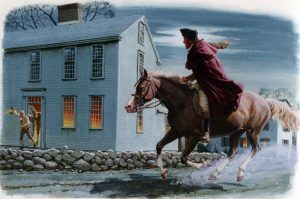 Paul Revere was a herald, riding through the towns crying “the British are coming, the British are coming,” a proclamation that left no room for discussion… believe and respond or disbelieve and suffer the consequences. And so is the message of the gospel that we are commanded to preach, to herald. We are not responsible for the response, that is the purview of the Holy Spirit.